We spend our lives searching for answers, looking for a purpose, or struggling to find our identity. What we may not realize is that the identity we struggle to find can only be found in Christ. He’s gone to great lengths to draw us to himself so that our lives may be transformed and lived for his purpose. God has made you alive for a purpose, HIS purpose, and we want to help you live it out every day (Ephesians 2). We are just like you! We are people who have questions about life, who sometimes struggle in our relationships, and who are at times stressed about our schedules and work life. The point is, we come from all walks of life. Whoever you are and wherever you come from, we’d love to meet you, serve you, and work with you to know, trust, and love Jesus. We have a desire for reaching those who don’t yet know Jesus, and this is reflected in our church’s name ‐‐ St. Andrew. Andrew was one of Jesus' first disciples. Immediately after meeting Jesus, he ran to find his brother so that he too might know and believe in Jesus. You can read the first account of Andrew in the Bible in the book of John, chapter 1, as John recounts the events he saw. St. Andrew is a church that started over 40 years ago when a small group of Christians met in a bank’s meeting room in downtown Middleton with a passion for sharing Jesus in the Middleton area. Since 1975, St. Andrew has grown because our members continue to bring their friends and loved ones to see Jesus. We now have three services with over 450 people worshiping each Sunday. The core of our mission’s focus is Love God, Love One Another, and Serve the World. This mission of the church dates to the earliest days of Christianity, and we strive to live this out in our worship, our Growth Groups and children's ministries, and our community engagement. At the same time, we're definitely serious about faith at St. Andrew. The Bible's message is unchanging, and it speaks to the true needs of today's people. Sin, death, guilt, shame, hurt, sorrow, anxiety, grief, discouragement, and doubt are issues that are faced by people in our world every day. And these issues, as well as many more, are all addressed by our holy and loving Creator in the Bible. God sent his Son, Jesus Christ, to be the solution to the sin that created all these problems in the first place. At St. Andrew, our main mission is to lead people to walk with Jesus Christ. Jesus says, "I am the way and the truth and the life" (John 14:6). St. Andrew is a member of the Wisconsin Evangelical Lutheran Synod (WELS). 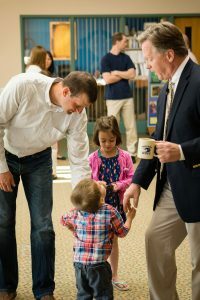 The WELS, established in 1850, is a Biblically‐conservative church body that is passionate about and committed to outreach and children’s education. With more than 1,200 congregations and 400,000 church members, the WELS is the third largest Lutheran church body in the US. The church body's congregations support 370 elementary schools, 313 early education programs, and 23 high schools. Also serving the WELS are 100+ missionaries and 200+ national workers who are sharing the gospel worldwide. In the mid‐1990s, the members of St. Andrew began the conversation about expanding their ministries to include a Christian day school that offered high quality, Christian education to children and their families. After several years of exploration, planning, and development, Westside Christian School opened its doors in 2001. Westside Christian School achieved accreditation by Wisconsin Evangelical Lutheran Synod, a member of the National Council for Private School Accreditation (NCPSA) in 2005 and again in 2012. The school was also accredited by Wisconsin Religious and Independent Schools Accreditation (WRISA) in 2012.